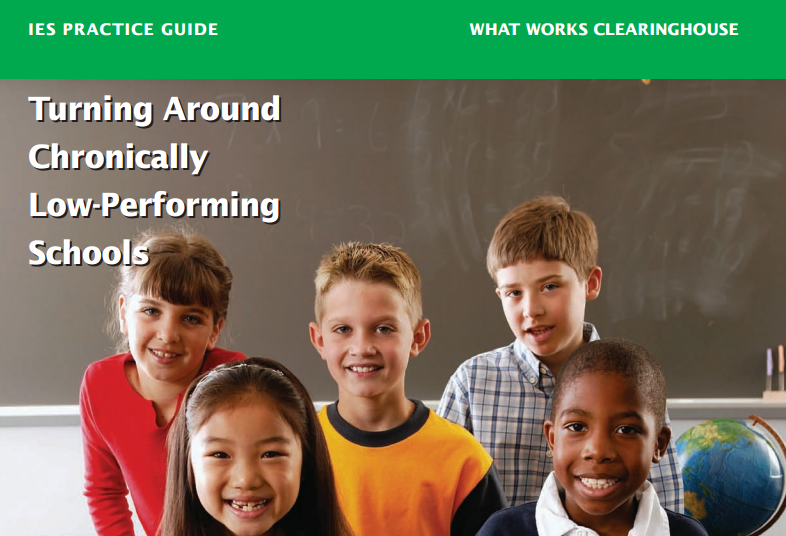 Herman, R., Dawson, P., Dee, T., Greene, J., Maynard, R., Redding, S., and Darwin, M.
The title of the practice guide, "Turning Around Chronically Low-Performing Schools", clearly speaks what this guide is about. Low-performing schools in this study refer to schools in the United States where at least one fifth (20 percent) of the students fail to meet the mathematics and reading standards. A school is considered as "turning around" if within three years, the fraction of students failing the standards is reduced by ten percent. This is a quick turn around. Of course, there are slow reforms that take much longer, but in cases where the performance of the school is truly lacking, time is of essence and reforms must deliver results immediately. A majority of public elementary and high schools in the Philippines will fall under the category of "low-performing schools" based on students' performance on the national achievement exams, for example. Thus, it maybe useful to look at what practices or reforms are currently supported by data. I am not aware of a ClearingHouse for such data or studies in the Philippines. A previous article on this blog, "Research Productivity in Education and Psychology", points out in very clear terms that this is an area that the Philippines is sorely lacking. Without a comparable practice guide in the Philippines, it maybe helpful to look at one that is made by an expert panel in the United States. 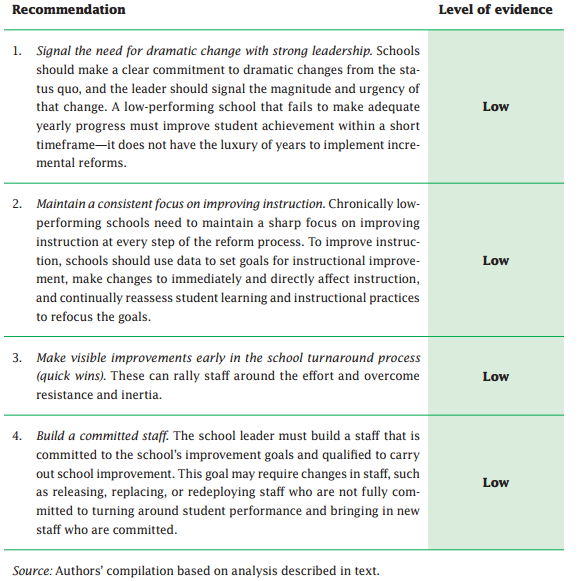 "Strong refers to consistent and generalizeable evidence that a practice causes better outcomes for students in turnaround schools or that certain leadership practices are effective for school turnaround. Moderate refers either to evidence from studies that allow strong causal conclusions but cannot be generalized with assurance to the population on which a recommendation is focused (perhaps because the findings have not been widely replicated) or to evidence from studies that are generalizeable but have more causal ambiguity than offered by experimental designs (statistical models of correlational data or group comparison designs for which equivalence of the groups at pretest is uncertain). Low refers to expert opinion based on reasonable extrapolations from research and theory on other topics and evidence from studies that do not meet the standards for moderate or strong evidence." Low therefore does not mean that the recommendation does not have a sound basis. There is supporting data although not general enough to draw clearly a cause-effect relationship. The recommendation is indeed an extrapolation yet it is made by experts and is made reasonably. In simple terms, these recommendations may not be foolproof, but these are still far better than guesses. The recommendations given above came from a study of low performing schools in the United States. The bad situation of these schools require specific measures. When a school fails to meet minimum standards, the last place to look for a solution is the curriculum. The four recommendations reflect this. The current dismal state of public school education in the Philippines definitely lies far beyond the curriculum. "Implementing a new curriculum requires strong leadership at the school level. The success of a school depends a lot on the principal. A significant fraction of public schools in the Philippines currently do not have a principal or a head teacher. This clearly needs to be addressed first before any reform in curriculum is initiated. Otherwise, a new curriculum has no hope of being implemented successfully." For the second recommendation, the implementation is not well planned with shortages in resources plus inadequate training of teachers. If the curriculum already fails in this step, what more could be expected at the assessment stage? With the third recommendation, the quick visible improvements are student participation and a general increase in teachers' morale. Decreasing the number of school dropouts is another, but K to 12 does not focus on "education for all". And teachers are generally unhappy with the changes. Unfortunately, the first visible result is confusion. This does not win the minds of the teachers and parents. With the last recommendation, K to 12 focuses so much on the curriculum that it fails to notice that the curriculum is in fact a very small part of education. K to 12 ignores the current predicament, working conditions and salaries of public school teachers. Thus, with regard to the question on whether DepEd's K to 12 matches any of the recommendations above, the answer is a clear "No".